Although there is certainly something to claims that excise and sin taxes hit the poor harder in proportional terms, these are a fairly small part of their comprehensive income and they’re probably offset by exclusions in many states for staples like groceries (which account for a larger part of low income households budgets). Net-net, the evidence I have seen leads me to believe that the fall-off in consumption taxes on upper income households is not nearly as large as it’s believed to be and it’s largely offset by state/local taxes on income….rendering a fairly flat “average” state/local tax burden and a (still) quite progressive tax code with federal taxes factored in. Fed Paper: Is the Consumer Expenditure Survey Representative by Income? The ratios of total expenditure to after-tax incomes by income shown in Figure 4 exhibit a dramatic pattern, and although there are some conceptual issues and systematic reporting errors with income taxes in the BLS tabulations, those sorts of corrections do not fundamentally change that pattern. The ratio of spending to income at low income levels seems implausibly high, and the ratio of spending to income at the top seems implausibly low. There are most likely problems with both income and expenditure reporting, and sorting households by income simply highlights those errors. The bottom of the income distribution includes many households who under-report income (e.g., the self-employed), and hence, the high ratios of expenditure to income at low incomes can be partially explained by the presence of these households. The argument that income is missing at the bottom is reinforced by a pragmatic view of lower income households. It is impossible to spend twice your income (Figure 4) if you have no assets to draw down and no access to credit, which is the basic conclusion one takes away from wealth surveys like the SCF or Panel Survey of Income Dynamics (PSID).Thus, except for students, households with temporary business losses, and retirees drawing down assets, the high rates of implied dissaving by lower income households in the CE are already implausible, and proportional scaling up of spending would only increase these, already implausibly high, spending-to-income ratios. It is also unrealistic to think that families above $100,000, on average, save the fraction of their disposable income implied by Figure 4, using it for purchasing stocks, bonds, and other investments that are not captured by the CE. Such behavior would yield average wealth to income ratios for higher income households that are much different than what we observe in wealth surveys (e.g., PSID and SCF). P.S., To be perfectly clear: while it’s true that individual households or families can spend more than their income in any given year (e.g., by drawing down savings, borrowing, etc) and that same particular groups might save a large fraction of their income in any particular year, the size and historical durability of this phenemenon clearly indicates that the relationship between BLS reported “consumption” and reported “income” is substantially off for both high and low income households. 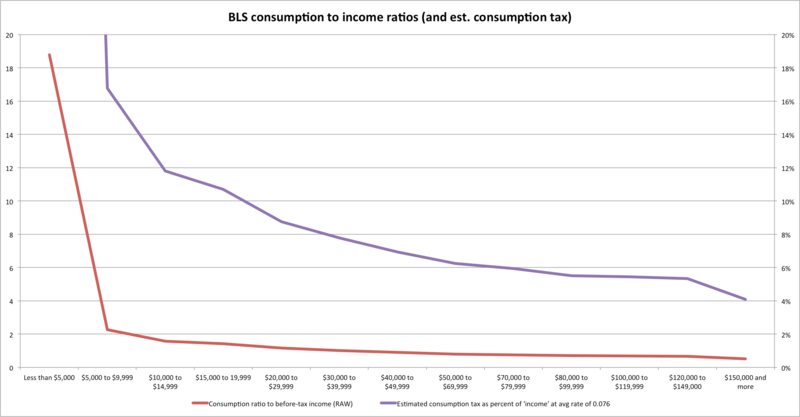 It’s therefore silly to attempt to impute consumption taxes to households with these same obviously flawed ratios. 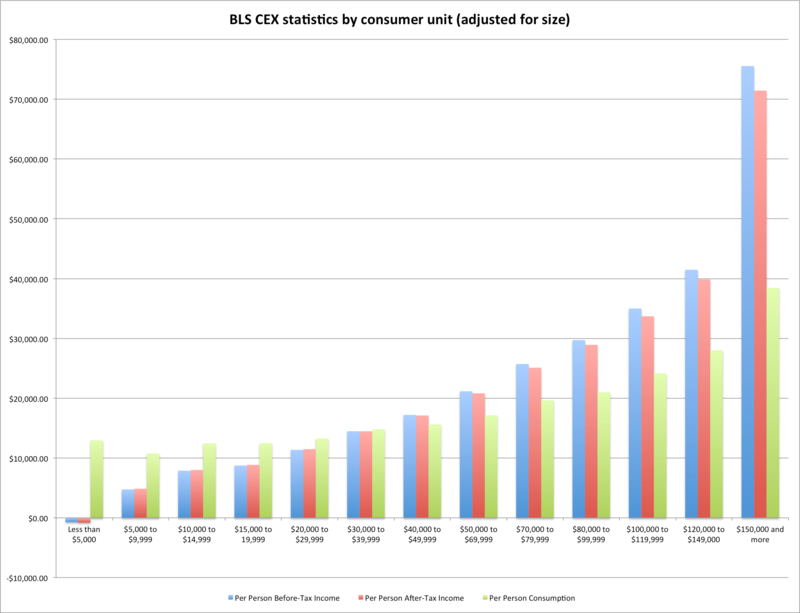 Below is a chart showing average per person consumption and income (both pre- and post tax) as according to these very same BLS statistics [hint: richer consumer units are larger than small ones according to their data]. Compare, for instance, the 10-15K unit to the 50-70K consumer units. Can anyone really believe that despite an average per person “income” ~160% higher that they only spend ~38% more per person? Or that the highest income groups only spend 2-3 times as much as the very lowest on a per person basis…? REALLY?? ?